CHICAGO (AP) Nick Martini picked a perfect time – and place – for his first major league hit. Covey, who was charged with four runs, left after walking Matt Joyce to start the inning and reaching a 2-1 count on Jonathan Lucroy. 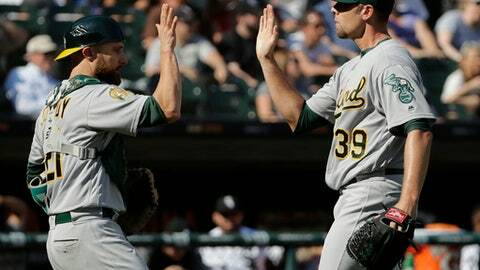 Chris Volstad completed the walk to Lucroy, then gave up a single to Franklin Barreto, a sacrifice fly to Dustin Fowler and Jed Lowrie’s two-run double.